Prepared by the U.S. Geological Survey in cooperation with the Kansas Geological Survey. 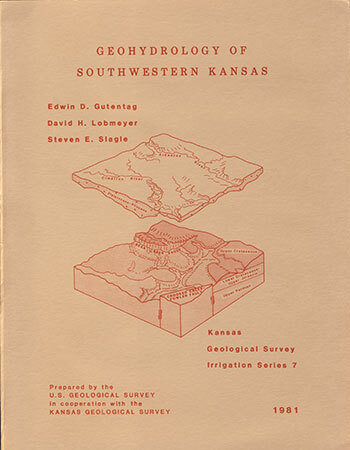 Originally published in 1981 as Kansas Geological Survey Irrigation Series 7. This is, in general, the original text as published. The information has not been updated. The publication is also available as an Acrobat PDF file. The study area includes about 8,900 square miles in 11 counties of southwestern Kansas. This is one of the principal areas of ground-water development for irrigation in the State. The area is flat to gently rolling and is drained by the Arkansas and Cimarron Rivers. Mean annual precipitation at Sublette is 19.45 inches. Consolidated rocks underlie the area in a broad northeast-trending syncline. This structure is bounded by major faults on the northwest and southeast. The surface of the bedrock, which maybe on Permian, Jurassic, or Cretaceous rocks, defines the lower limit of the principal aquifer in the unconsolidated deposits. Minor amounts of water for irrigation use are available from gypsum in Upper Permian rocks, sandstones in Upper Jurassic and Lower Cretaceous rocks, and chalk in Upper Cretaceous rocks. The principal sources of water used for irrigation are the sand and gravel layers in Pliocene and Pleistocene deposits and inQuaternary alluvium in the stream valleys. These sand and gravel layers, collectively termed the unconsolidated aquifer, underlie about 75 percent of southwestern Kansas. In the main part of the unconsolidated aquifer, saturated thicknesses range from less than 50 feet to about 630 feet, and yields to irrigation wells commonly range from 500 to 1,500 gallons per minute. The total quantity of water available for pumping was estimated in 1975 to be 105 mill ion acre-feet. The chemical quality of water in the aquifer ranges from a calcium bicarbonate type to a sodium chloride type. The number of irrigation wells in southwestern Kansas has increased from 420 in 1945 to about 7,000 in 1975, and irrigated land has increased from 124,000 acres in 1950 to 1,400,000 acres in 1975. Since 1940, pumpage of about 14 million acre-feet of water from storage has resulted in water-level declines ranging from 0 to 135 feet. Saturated thicknesses have decreased as much as 60 percent in a few areas and have decreased a median of 8 percent within the main part of the aquifer. Placed on web July 28, 2013; originally published 1981.